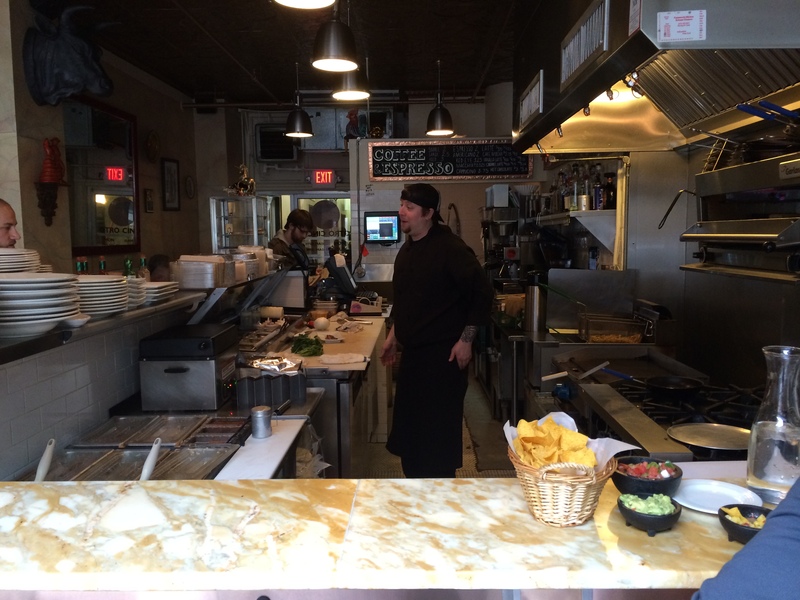 To call Otro Cinco “small” would poorly characterize what chef Carl Helgersen is doing behind the counter. Sure, the footprint is about one-quarter of the space its sister restaurant Alto Cinco occupies on Westcott Street, but there is nothing small or little about Otro Cinco. Yes, there are only five or six tables and another 6 or 7 stools of counter seating, two of which were occupied by The Wife and I overlooking South Warren Street on Friday evening. Yes, the restaurant is so tight on space that we could tell when our food was hitting the pan. It reminded me of one of the kitchens Anthony Bourdain walks into in another country, where he orders directly from the chef and has it prepared in front of him. And, yes, the restaurant shares bathrooms with the rest of the first floor tenants in its building. But, none of those factors present a deterrent from returning. To judge Otro on its size would be unfair. In fact, it punches well outside of its weight class. We wandered in around 5 p.m., with a few tables occupied, and took our perch in the front window. The staff is small, with Helgersen, an assistant, a dishwasher and a waiter, manning the ship. Otro has a limited bar menu with a handful of very reasonably priced bottled craft beer — I enjoyed a Bell’s Oberon Wheat Ale for $4 — and an eclectic lineup of cocktails ranging from a traditional margarita made with fresh citrus to The Wife’s Matador — white tequila, and pineapple and lime juices. We placed an order for chips and salsa with the drinks. Helgersen warms each order of chips under the broiler before serving, heating and toasting them. It contrasted nicely to the fresh pico de gallo, a blend of tomatoes, onions, lime juice, and bell and jalepeño peppers. The Wife declared the salsa to be the best she has ever had. Friday’s specials included a pair of items that we ordered. 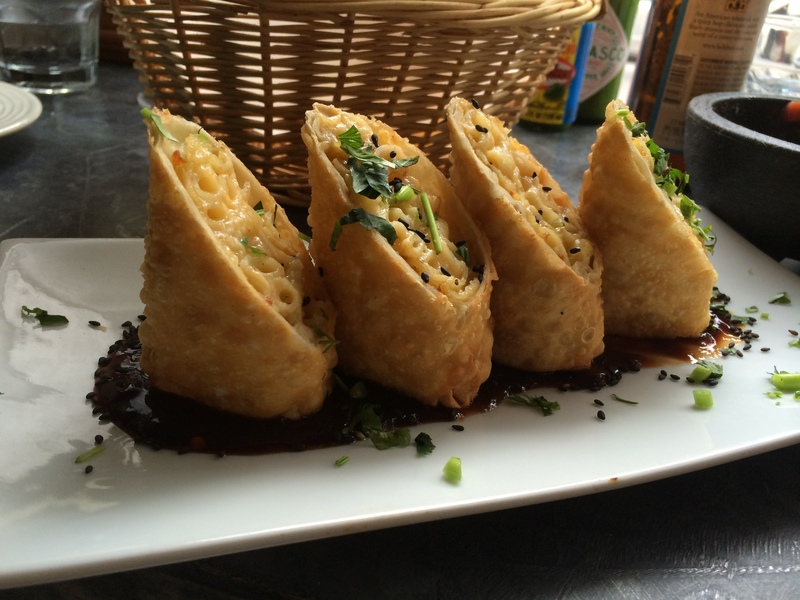 Two blocks of macaroni and cheese, wrapped in corn tortillas and deep fried, carried the name zion rolls. Each block was sliced in half and served over a spicy Korean barbecue sauce with black sesame seeds. Deep-fried mac and cheese is not a foreign concept, taking flight at state fairs, but this presentation had sharp contrasts. The earthy, spicy sauce paired nicely with the creamy mac and cheese stuffing. The menu at Otro differs slightly from Alto as there are more Spanish elements, including tapas and paellas. While we leaned towards the Mexican elements of tacos and burritos, the idea of a well-prepared paella available in the Greater Syracuse area is more appealing than not. The menu counsels diners that paellas are made to order and will take more than 30 minutes to prepare. Three are offered: mushroom and green olive, vegetarian, and a seafood presentation with clams, shrimp, mussels and squid. 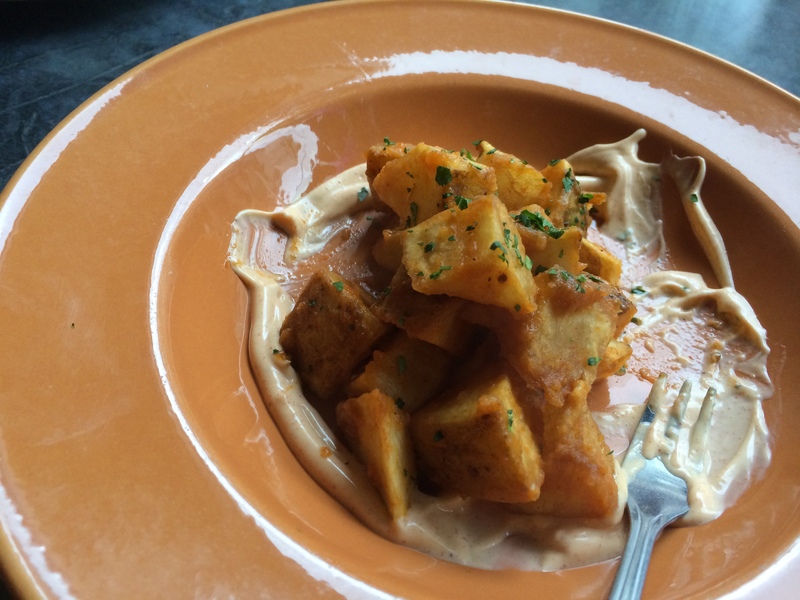 While we bypassed tapas for dinner, I ordered the patatas bravas. Helgersen’s version incorporates a smoky pimento cream sauce that leans more towards the dairy than spices. This was good for The Wife who tends to not like overly spicy dishes. These provided a nice jumping off point for dinner. 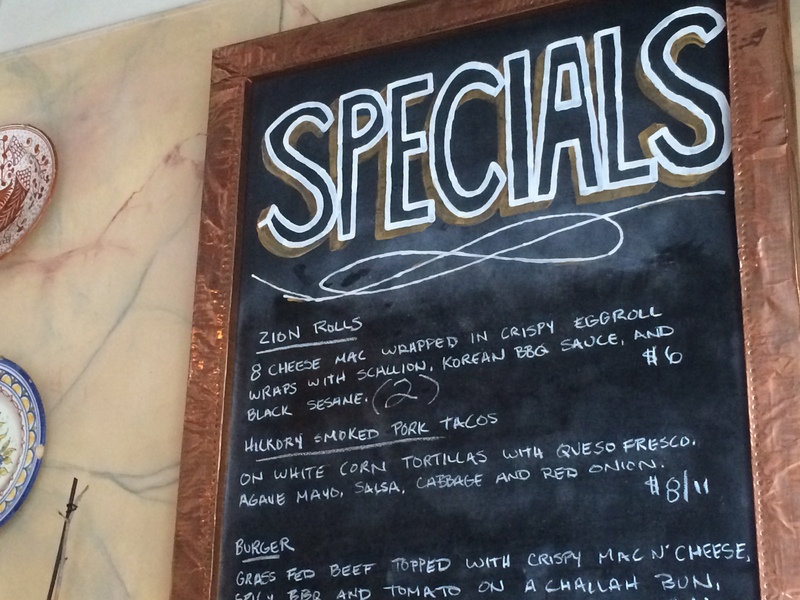 On the specials list were hickory-smoked pork tacos, served as either two or three. The Wife’s duo of tacos were stuffed with pork, salsa, marinated cabbage salad, queso fresco and agave mayo, and were gone before I was halfway through with my dinner. Silence from The Wife during the entree is the ultimate vote of approval. When ordering from Alto, I fall into the habit of ordering burritos and rarely vary from the catfish or mushroom and spinach versions. To change things up, I opted for shrimp. 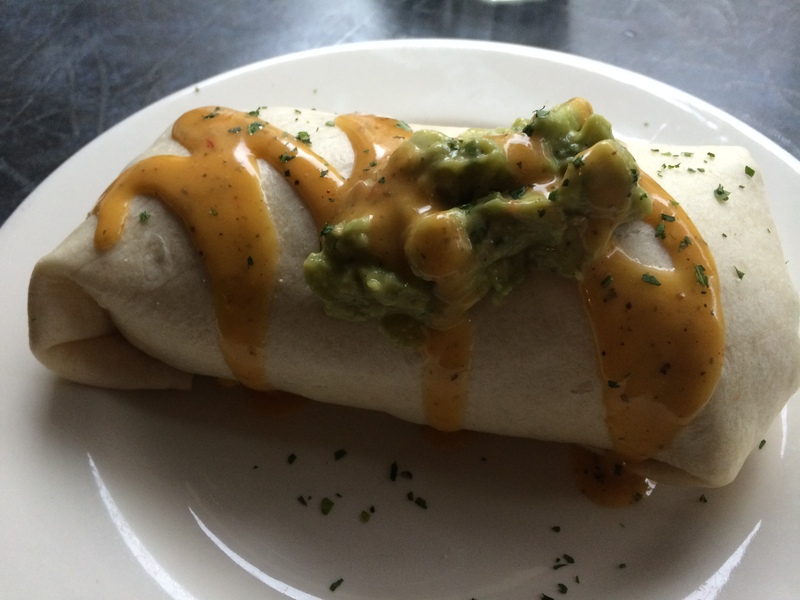 While the protein was different and it came from a different kitchen, Otro keeps the Alto burrito spirit alive. 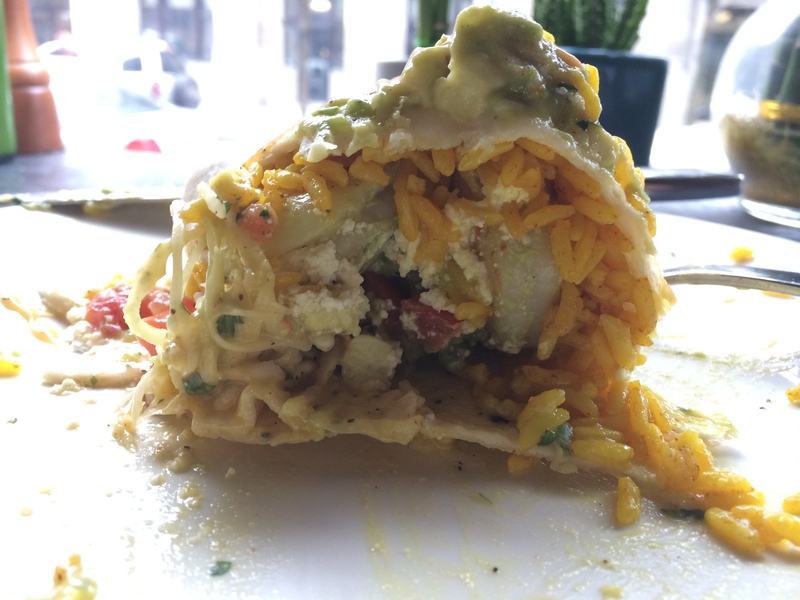 The flour tortilla was bursting with quantity and quality. Shrimp and yellow rice were mixed with avocado, cabbage, queso fresco, cabbage and an orange-chipotle sauce, rolled as tightly as possible and topped with salsa verde. The leftovers in my fridge were because I could not could not, as opposed to would not, finish. We skipped dessert, which included banana run creme brulee and peanut butterscotch pie. Downtown dining usually means a trip to one of the restaurants in Armory Square that we like — Pastabilities, Empire Brewing Company, or bc — or The Mission. There had never been much reason to venture to South Warren Street, other than slices at Pavone’s. 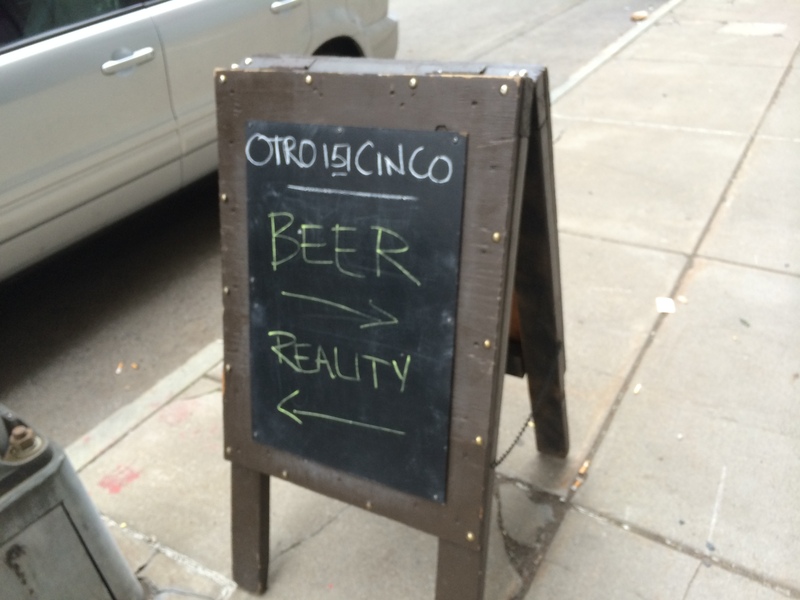 Otro Cinco has changed that, offering a unique diversion from its space in Westcott Nation. 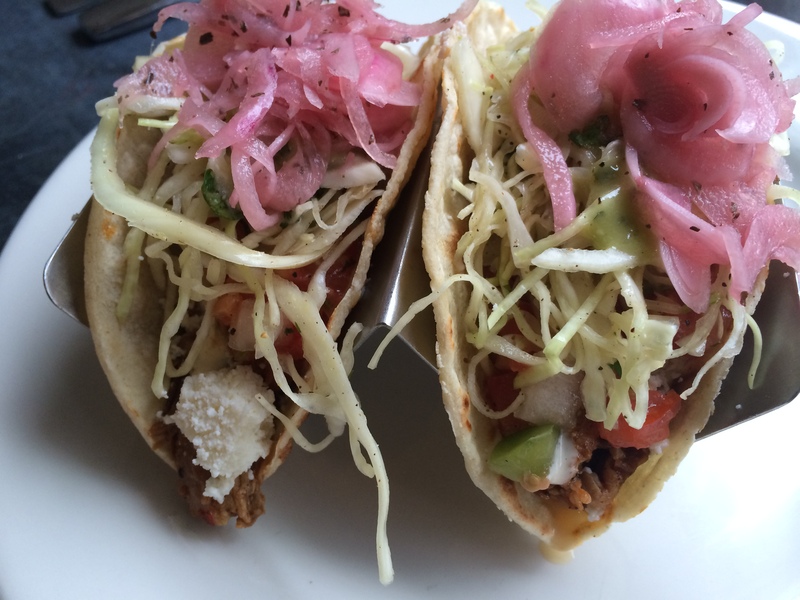 Otro Cinco’s menu, atmosphere and experience are bigger than its diminutive footprint. I just hope I can find a seat when I go back next time. 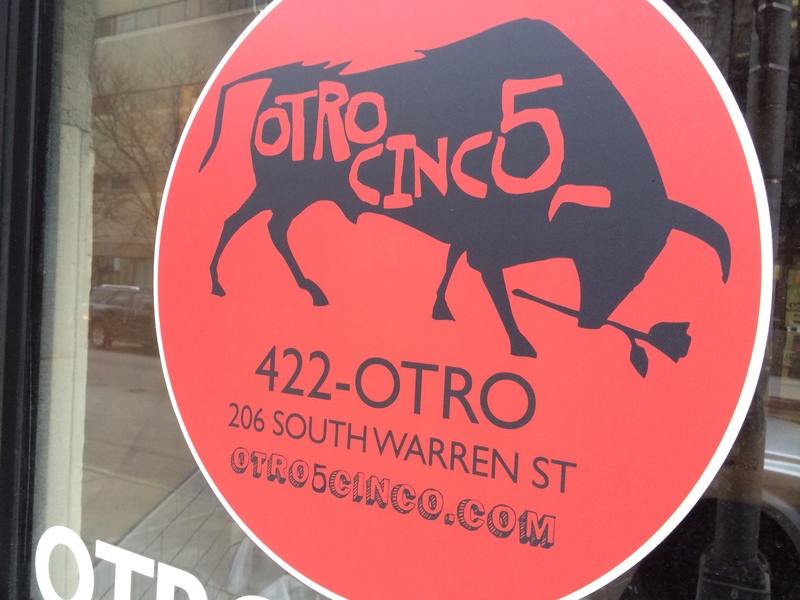 Otro Cinco is located at 206 S. Warren St. in Downtown Syracuse. It is open weekdays for lunch and dinner from 10 a.m. to 10 p.m., and for dinner only on the weekends, from 4 to 10 p.m. Reservations are not accepted. Parking is on street or in neighboring lots and garages. Dinner for two, plus drinks, was $52.11 before tip.